Nitrile Butadiene Rubber Latex Market size is forecast to exceed USD 2.4 billion by 2025; according to a new research report by Global Market Insights, Inc.
With increase in capital expenditure by private companies and governments in healthcare infrastructure, it is likely to boost the technological innovations, low cost drug delivery systems and low-cost production of generic drugs. In addition, rise in per capita income of people in developing nations, has led to an increase in the individual healthcare spending in these countries. The gloves manufacturing has also received a high demand since the outbreak of major epidemics across the globe. The industry is likely to witness substantial growth over the forecast timeframe, subsequently driving nitrile butadiene rubber latex demand over the next few years. High product cost and fluctuations in crude oil prices might hamper nitrile butadiene rubber latex market size growth over the forecast duration. Synthetic rubber is made from petrochemicals products which are derived from crude oil. Constant fluctuations in demand supply dynamics of crude oil market brings peak variations in prices and thus commodity market. This will obstruct NBR latex market growth in the coming years. Medical gloves held the largest share in gloves market in 2017. It includes surgical and examination gloves. Industrial gloves include gloves for materials and chemicals handling and protecting workforce from potential hazards through chemicals. Glove manufacturers in Asia Pacific export to countries including the U.S., Russia, Ukraine and other countries in Latin America and Europe. This will fuel nitrile butadiene rubber latex demand over the forecast duration across Asia Pacific. Increasing industrial bases across developing countries will have positive influence on industrial gloves demand in the coming years, which will subsequently accelerate NBR latex market volume over the forecast timeframe. Industrial gloves are used across metalworking, automotive, steel, iron, mining, component manufacturing and chemical industries. 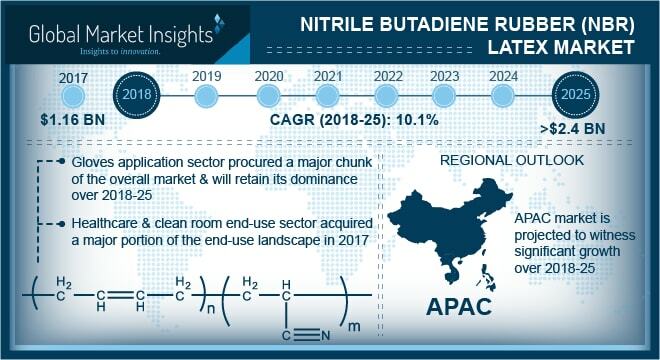 Nitrile butadiene rubber latex market for healthcare & clean room industry has a high growth potential and this end-user segment is estimated to grow with substantial CAGR during the forecast timespan. The main factor driving this tremendous growth is the rising gloves consumption across medical and pharmaceutical sectors. Nitrile butadiene rubber latex is widely used for gloves production as it provides the desired strength and chemical resistance, which is required in healthcare industry. NBR latex market is directed by environment protection associations to a considerable extent. The product is mostly made of petrochemical derivatives that causes pollution and are hazardous to environment. Moreover, product is mostly used by the medical industry due to which there are certain regulations are imposed by the healthcare industry. Asia Pacific will be the fastest growing region in global NBR latex market over the forecast duration. The region has presence of many multi-national latex producers and glove manufacturers, which reduces the overall cost of glove manufacturing and hence wide reach to companies requiring gloves. Low-cost labor and raw materials are two prime factors which have led to low prices for nitrile butadiene rubber latex and eventually gloves in this region. Companies in Asia Pacific have adopted strategy of production capacity expansion to grad larger chunk of market share. Kumho and Synthomer are top two companies producing NBR latex in the region.